FOMO Travel markets and promotes must-do travel experiences across the globe, including Spring Break. We are a one-stop online shop for all your Spring Break travel and accommodation needs. We provide Spring Break travel and tour information and advice and you can also Search and Book Spring Break Eve Flights, Search and Book Spring Break Accommodation, Search and Book Spring Break Tours, as well as Search Travel Insurance for Spring Break. We also have tour operator comparisons and Travel Tools for numerous events around the world. We have all your information and advice you need to cure your travel FOMO for Spring Break. Spring Break is a vacation period in early spring at universities and schools in various countries around the world. In the United States, Spring Break at college and university can occur from late February to early April. Spring Break is a must-do event on any college students calendar and one of the major causes of travel FOMO. FOMO Travel provides an extensive array of information and advice on affordable travel options for Spring Break. We want you to get the most out of your Spring Break experience and we feature information and advice on tour operators, travel options, travel tips, party spots and other activities. There is so much to do at Spring Break and we want to make sure that you enjoy it all. Why? Because you don’t want to miss out. Think must do, think travel FOMO! Since the late 1800's American college students have participated in a travel vacation away during the spring vacation period. From the end of World War II until the 1980s, Fort Lauderdale, Florida, was a notorious Spring Break destination in the United States for college students. It was largely made so by the efforts of one man, George Warren "Bob" Gill Jr, who was called "the Father of Fort Lauderdale Spring Break". In the late 1950's media outlets including, Life Magazine, Time Magazine and Look Magazine reported that college students from all over the country flocked to the beaches of Florida and the Bahamas in March. As a result Fort Lauderdale became the first Spring Break destination. A student interviewed by Time Magazine at the time explained that she had come to Fort Lauderdale because "this is where the boys are." This comment set the scene for the 1960’s Movie - "Where the Boys Are". "Where the Boys Are" premiered at Fort Lauderdale's Gateway Theatre on Sunrise Boulevard on December 21, 1960. The movie was a massive success and promoted the annual event across the country of the mass migration of college students to the beaches of Fort Lauderdale. The "College Student Invasion" began 90 days later in March of 1961 with over 50,000 college students arriving in Fort Lauderdale, overwheming the 80,000 local residents. In the early 1980s the local residents of the Fort Lauderdale area became so upset at the damage done by Spring Breakers that the local government passed laws restricting parties in 1985. As well, this was around the time that the National Minimum Drinking Age Act was enacted in the United States. The passing of this law meant that Florida raised its minimum drinking age to 21. This event inspired many 18 to 20 year old college vacationers to travel outside the United States for Spring Break. By 1989, the number of Spring Breakers heading to Fort Lauderdale fell from 350,000 at its peak, to just 20,000. In 1986 a new hot spot was emerging in Daytona Beach. This was mostly as a result of MTV’s first Spring Break from Daytona Beach that same year. 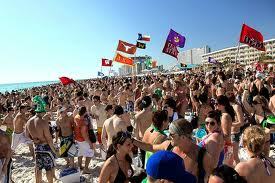 In the following few years up to 200,000 students headed to Daytona Beach for Spring Break. Daytona's local government undertook similar measures to Fort Lauderdale and the crowds of the mid-1990s and early 2000s had fallen away. Panama City Beach in Florida is now the most popular Spring Break destination due to its relative proximity to many southern colleges and driving distances. The locals in Panama City Beach welcome Spring Breakers every year, making Spring Break a major factor in the city's economy. South Padre Island in Texas is also a popular Spring Break destination among students from colleges in the south-central and midwestern parts of the country. Daytona Beach has re-emerged as a top Spring Break destination. One of the new up and coming destinations for Spring Break is Las Vegas, Nevada. In March 2011, MTV hosted its annual Spring Break at the Palms Hotel and Casino. Las Vegas has now become one of the top domestic Spring Break destinations. Fort Lauderdale’s beach city to the south, South Beach Miami, is also becoming a popular destination with college students for Spring Break. Popular Spring Break destinations outside of the United States include Cancún, Cabo San Lucas, Mazatlán, Puerto Vallarta and Acapulco in Mexico, as well as the Bahamas, Jamaica and other Caribbean islands. One of the major factors for the increase in overseas destinations is the lower minimum drinking ages in these places. Tour operators actually have special chartered flights to these destinations during Spring Break, quite often at very cheap rates.